Did you know that everyday the energy equivalent of over 4 trillion barrels of oil fall on the United States in the form of solar energy? Have you ever wondered what we can do with this energy other than heating water and making electricity? 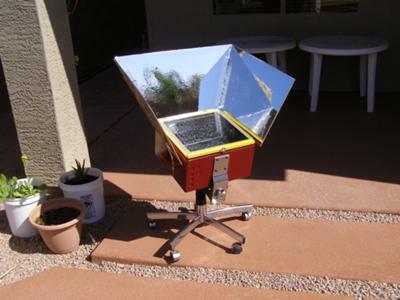 How about trying solar cooking? My wife and I asked ourselves these questions and said, “Hey, why not try solar cooking?” So we did a bit of research on line and found some really neat do-it-yourself solar cookers. We found three types that we could build, parabolic, box cooker and a panel cooker. The panel cooker looked easiest to make, so we did. We built a small solar panel cooker which has reflective Mylar adhered to one side of a cardboard form. This is then placed in the sun with a black pot containing your food inside of an oven bag. We were amazed as we were able to cook a chicken in about an hour and achieve a temperature of over 250 degrees. We have since cooked chili, roasts, ribs, veggies, rice, beans, corn bread, cakes and fish in this simple device. All with the power of the sun and this simple device! Since our initial success, we have built a box cooker and a parabolic cooker. The box cooker has been our favorite as we don’t have to use the oven bags and any pot will work in it. Our temperatures are around 375 on a sunny Arizona day. We once tried a tri-tip roast and it came out so tender and flavorful our friends could not believe it was solar cooked. Food just tastes better when solar cooked. 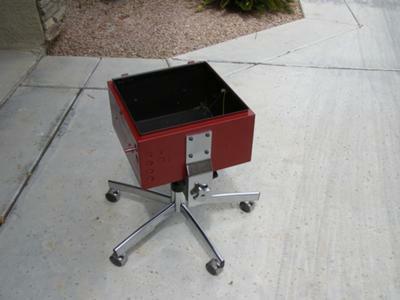 One of the most fun projects we did was to mount our heavy box cooker on an old office chair pedestal. This allowed us to set the box at an angle to the sun because of the reclining back rest support. The wheels allow us to push it anywhere in the back yard and it is heavy enough to be stable in the wind. Plus old office chairs are really cheap and are easy to mount a cooker on. Thank you very much for such a detailed and infomrative narrative of your solar cooker exploits and the great results! Your experiences will definitley motivate others to try the same. I really like it when our visitors go into such detail about their solar cooking experiences, it is so helpful to others who are investigating solar cooking for the first time as well as to the experienced solar cook. Thank you for the great photos as well, very nice cookers. Watch your local garage sales. They can be had for next to nothing.